The western end of the W2W route at Sandy Gap on Walney Island is reached by bridge from Barrow-in-Furness, one of Cumbria’s larger industrial town’s which grew from a tiny 19th Century hamlet to the biggest iron and steel centre in the world, and a major ship-building force, in just 40 years. Walney Island is ten miles long but less than a mile wide, and has two important nature reserves. The northern one has an area for preserving Britain's rarest amphibian, the Natterjack Toad, and the southern has the largest nesting ground of Herring Gulls and Lesser Black Backed Gulls in Europe. Cycling around the island can be very pleasant with great views across Morecambe Bay and of the Lakeland fells. Between Walney Island and Barrow is tiny Piel Island with its 14th Century castle, built by the monks of Furness Abbey to protect their harbour from the Scots. It’s reached by a summer weekends only ferry from Roa Island a few miles south of Barrow (access details from the Tourist Information Centre), but the road to get there can be busy with fast moving traffic. 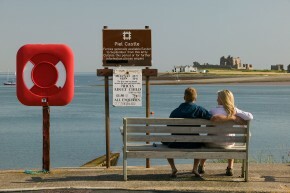 Barrow’s two main visitor attractions are right on the route. 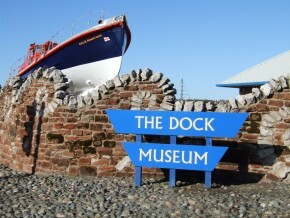 The Dock Museum (just over a mile from the start) is a spectacular modern museum built over an original Victorian graving dock, where you can explore the fascinating history of ship building in Barrow. The impressive remains of Furness Abbey (four miles from the start) are where Cistercian monks smelted iron with wood in the 13th Century. Not open to the public, but clearly seen from the route (opposite the Dock Museum) is the huge covered ship building hall of BAE Marine Systems (formerly Vickers), the largest of its kind in Europe. Barrow is one of a few planned towns in England (and fewer still in the 19th Century). The wide tree lined streets give a spacious and relaxed feel to the place, and it’s definitely worth allowing some extra visiting time. There are plenty of shops, eating places and some cyclist-friendly places to stay. View more information about Barrow.